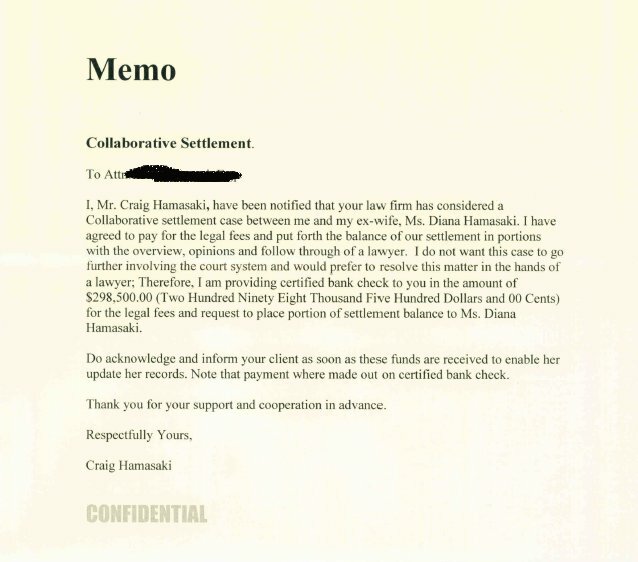 Lawyers in Ontario and Michigan have notified us that they have been contacted by the purported Diana Hamasaki with regards to a divorce settlement. This is a fraud we have seen before under several other names and similar scenarios. For details on how this fraud works and a full list of names attached to it see our Confirmed Fraud page. I am currently on assignment in South Korea. 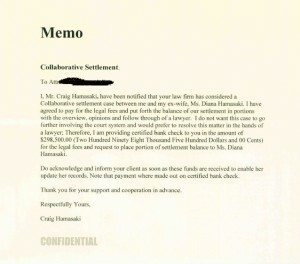 We had an out of court agreement for him to pay $623,000,00 plus legal fees. He has only paid me $122,000.00 since. I am hereby seeking your firm`s assistance in collecting the balance from him or litigate this matter if he fails to pay as promised because He has delayed for too long. If you are in the position to represent me at the moment kindly advice immediately. A lawyer in Illinois received a fake cheque from a Canadian bank.